I love watching remakes of old movies! I got to see Snow White and the Huntsman this past week with my brother and cousins. The cool part is when they look at the story from a different angle, or another character’s perspective. Of course there is always a little love story in there, but what really stood out to me was the Queen. I’m not evil or siding with her, but she interested me the most. 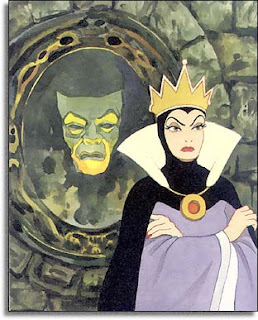 We've all heard the famous quote from the movie that says “Mirror Mirror on the wall, who is the fairest of them all?” – The Queen only wants to hear one answer "You, my Queen, are fairest of all". If she'd ever hear anything else, it wouldn't be a happy day - like when she found out that Snow White was 'fairer' than her. There just comes a point in our lives where we have to realize what we do affects the people around us. Unless we live in a cave and interact with absolutely nobody, everything we do has somewhat an effect on those around us - our irresponsibility usually becomes another's responsibility. I tried to find who to point the finger at, but it always ended up being directed back to me. I learned this the hard way throughout college, and am still learning throughout the workforce. Buoyancy - remember that word from physics? I heard a great analogy of a biblical principle that can be seen easily here. St Paul says in Galatians 6:7 ".. a man reaps what he sows". I don't need to be all-knowing to understand that if I don't study for an exam, that I probably won't do that well, or if I smoke cigarettes that it can cause damage to my body. If bad things come across our lives, we usually look up to God right away and blame Him, or better yet - question Him. Why does God do this or allow me to lose my job - He probably hates me. On the contrary, its because He LOVES us so much, that He gave us this principle beforehand so we can abide by it! Now what does this have to do with buoyancy? That's the principle in physics that determines whether something will float or sink. Some things in our life either sink, or they float - we don't necessarily have to correlate them to bad and good, but it's just a principle. Just like when people build boats and ships, they have to abide by that rule. God isn't sitting up in heaven and pointing saying "you can float, you sink, sink sink, float, etc" It is just a principle - if the builder adheres to it, it will float every time. Sometimes we need to just take responsibility for certain things and quit playing the blame game with God. The last thing I just want to touch on is something that we may not have thought as a responsibility, but is very essential as a Christian - and that is sharing the Good News with others. Understood, some people are meant to be in the spotlight on stage, some hold the lights, some do the backstage work - but that does not excuse any of them from having the same goal, which is to be a part of sharing a great show. St John Chrysostom says, "Each one is responsible for the salvation of his neighbor" If we look at it like our salvation depends on the salvation of others, then it is our full responsibility as sons and daughters of Christ, to share Him with everyone we encounter. After all, who would enjoy a wedding feast if they were all alone?